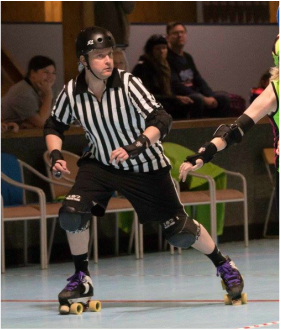 Dr Wheelgood - 404 (Referee / Skater) - Christchurch Roller Derby. Strong City. Stronger Skaters. I'm also a tech guy and 404 is the page not found error for websites. If I'm wearing an 8, it's for the 8 bit computers I have fond memories of. Aside from learning to skate generally, transitions on my gammy side are challenging, and getting my feet to do 'smarty feet'. They just don't seem to want to coordinate that way! I was introduced to ORDL by Ice-Tia as they needed more refs. I hadn't skated since I was very young, and was very slow and uncoordinated even then. To start with the fastest I got around the track was being towed by Da Roll. But sticking with it and with great help (and patience!) from ORDL coaches has helped me improve immensely! They are fantastic! Would you rather fight 100 duck sized horses, or 1 horse size duck? If I had to fight it , probably the horse sized duck, as lethal as it would be. Duck sized horses would be too cute to fight.